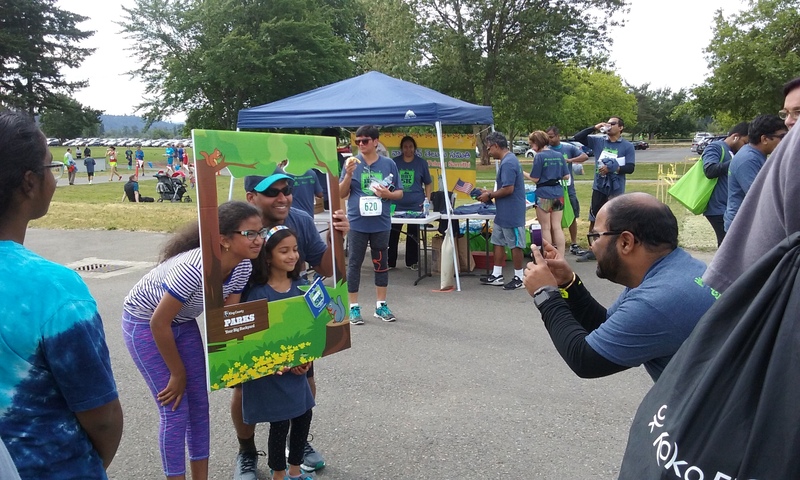 The Seattle area has two major parks that can host “backyard” races and enable runners to avoid cars, large potholes and hills: Magnuson Park in Seattle and Marymoor Park just south of Redmond. Thank goodness for both of them. This was my third road run since ankle surgery last December, and my 216th race since 2001. Probably 10 percent of all those races have started, ended or traveled through Marymoor Park, though it would take me awhile to do the math. Of the 34 organized bike rides I’ve done since 2011, the percentage is even higher. 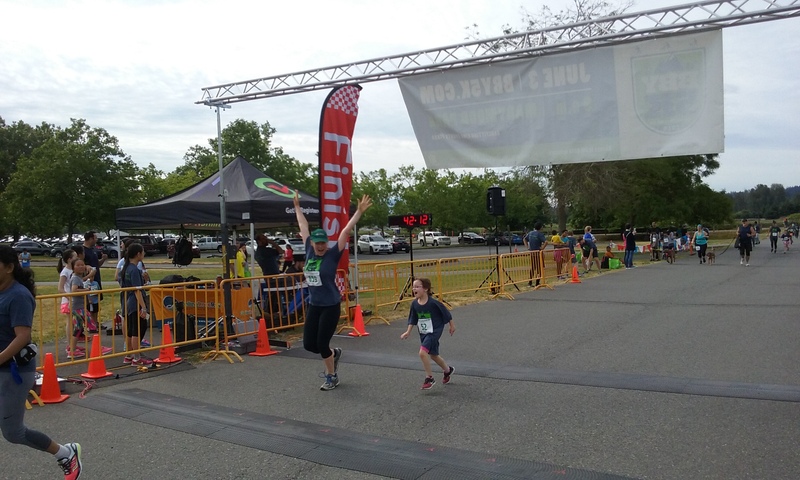 What’s more is that Marymoor and two trails that connect to it — the Sammamish River and East Lake Sammamish trails — have been some of my primary training grounds for races and rides the last 20 years. Indeed, I am grateful to live and work near this vital recreation center for the region. 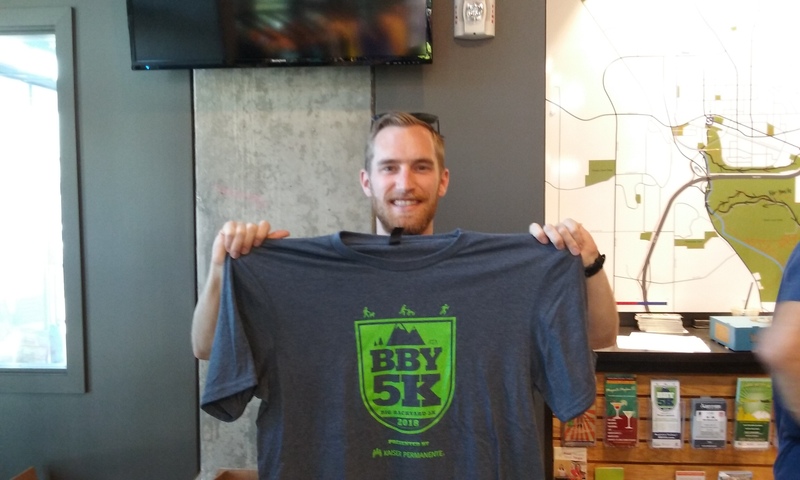 Last Sunday’s race was the 9th annual Big Backyard 5K, but my first. It’s usually the day after the Flying Wheels Summer Century, which has been my focus the last six years. 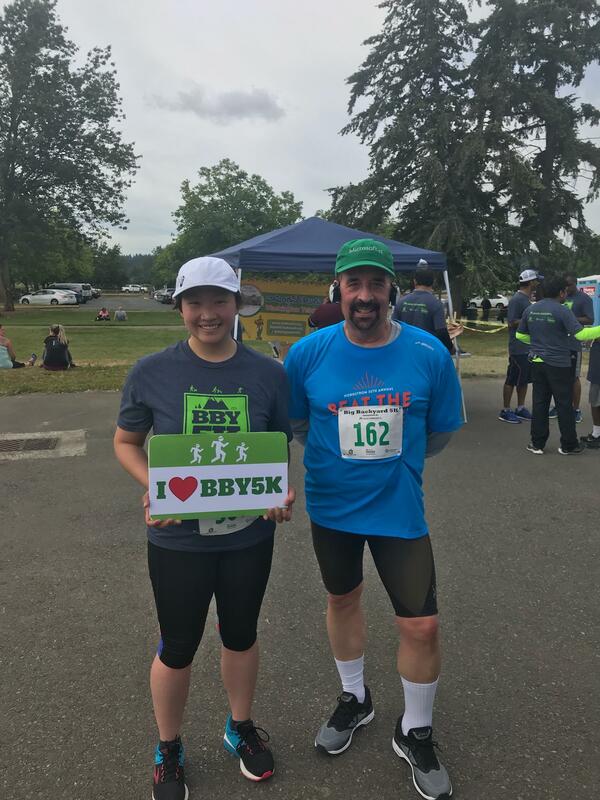 This year, because of my bike fatigue from riding the 7 Hills of Kirkland on Memorial Day, I skipped the Flying Wheels and did the BBY 5K. Allytics colleague C. Hayley Halstead joined me; we got a good workout and it was awesome to do a race again with Hayley (the last one we both did was the 2017 Hot Chocolate 15K). I have a bit of guilt about missing the Flying Wheels ride for the first time since 2011, and had it not been in the same week as the 7 Hills ride, I wouldn’t have. So, instead of riding my bike from Marymoor Park to points all over east King and Snohomish counties, I simply ran from one side of the park to the other and back. Our 3.15-mile course approached the Sammamish River Trail to the west and the East Lake Sammamish Trail to the east, but did not step onto either trail. The race stayed inside the park and started and ended near the Marymoor Velodrome, in the center of the park. It was a family-friendly race with no goofy costumes or beer gardens, although there were dogs and the usual strollers. 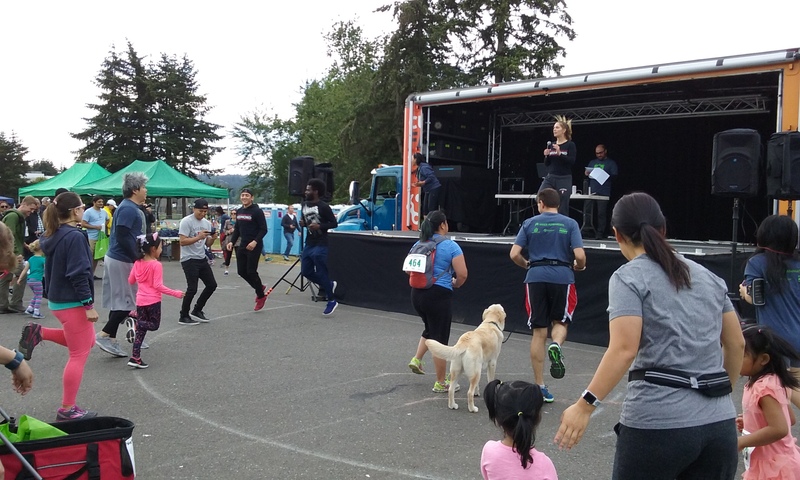 Nearly 850 ran or walked it, and the run drew a large number of workers at nearby Microsoft and their spouses and kids. There was a kids’ dash too, but dozens of kids participated in the main 5K. Marymoor’s running trails are narrow, and there was congestion throughout the run. I ran for a time next to a guy carrying a backpack with a small child in it. But running room opened up for me after a half-mile, as we ran toward the softball fields on the west side. Hayley said she spent much of the race dodging kids. The second 1.5 mile of the race was a hairpin turn with the elite runners heading to the finish line as the rest of us running out to the Connector Trail turnaround near the East Lake Sammamish Trail. Not a lot of running room on the divided trail, but no mishaps. 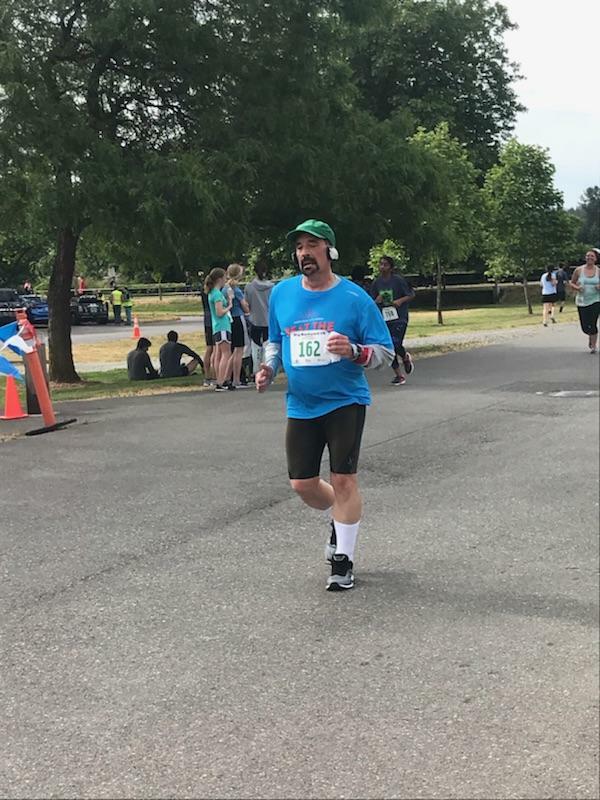 I was happy to lower my post-second surgery 5K time to 38:34 (12:25 per mile), an improvement from the 45:27 time in my one earlier 5K in late April. It was good for 431st place out of 844 finishers. Hayley finished ahead of me at 33:22 (10:45 per mile) for 302nd place. Full results are here. Nice job, Hayley! 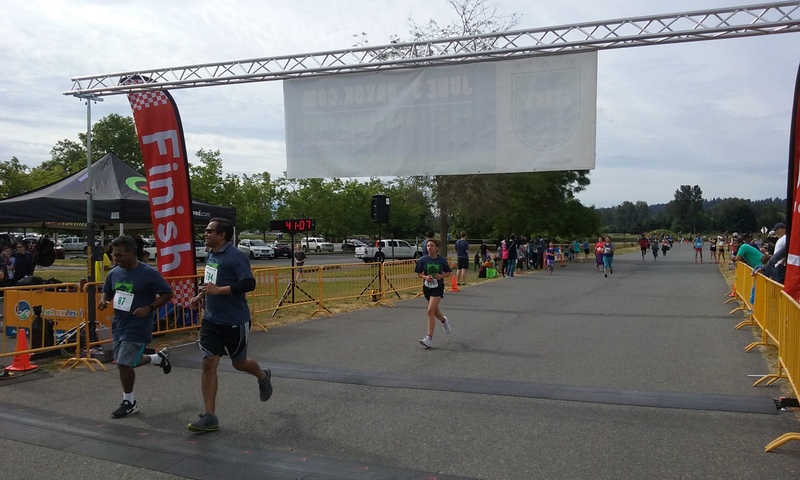 Interestingly, this was the first time I’ve run this particular Marymoor course, as it was different than courses for the Washington Beer Run 5K, the Overlake Labor Day Half-Marathon 4-mile run, and other races I’ve done at the park. Most runs spill onto the Sammamish River Trail, but because this one didn’t, it was flatter and faster. I have another chance soon to beat this time (my best time since 2011 is 34:29). Myself, Hayley and a few others at work are planning to run the Redmond Derby Dash 5K on Friday, July 13. If I don’t do the Washington Beer Run again on June 17, this will be my next race. It covers a flat stretch of the Sammamish River Trail near Redmond City Hall and is usually my fastest 5K of the year. Before I forget, best of luck to Allytics colleagues Kerry Stevenson, who is running the Rock ‘n’ Roll Seattle Marathon, and RJ Ricker, who is running the Half-Marathon this Sunday! Wish I could join them. Maybe next year. This entry was posted in 5K, 7 Hills of Kirkland, ankle surgery, Bicycling, Century, Flying Wheels, Marathons, Marymoor Park, Rock 'n Roll Seattle Marathon, Running, Sammamish River Trail and tagged 5K, 7 Hills of Kirkland, Allytics, ankle surgery, Bicycling, Big Backyard 5K, Flying Wheels, Half-Marathons, Magnuson Park, Marathons, Marymoor Park, Rock 'n Roll Seattle Marathon, Running, Sammamish River Trail. Bookmark the permalink.